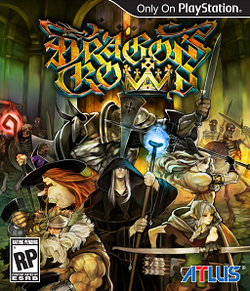 Dragon's Crown is a 2D fantasy action role-playing video game developed by Vanillaware with assistance from Atlus. Though originally set to be published by UTV Ignition Entertainment, the company eventually dropped from the project in 2012, transferring all duties to Atlus. The game will be released on PlayStation 3 andPlayStation Vita in July 2013 in Japan, North America the following August, and Europe for an unspecific date in the Fall. Produced by George Kamitani, the game is designed to be an evolution of the "beat 'em up" action game genre while still retaining the company's trademark 2D hand-drawn graphic style. Set in a medieval world of swords and sorcery, the game supports up to four players traveling through dangerous dungeons and labyrinths in search of fortune and adventure. Cooperative options include local multiplayer or the use of Sony's PlayStation Network service, with data-sharing of save games between both the Vita and PlayStation 3. Each of the game's six playable classes possesses their own unique skills, strengths, and weaknesses, and can be customized to a degree based on the player's preference as they gain experience.